A picture is not only worth a thousand words, but a free two-night weekend stay in New York City, courtesy of the Your Favorite NY Moment Photo Contest just launched by the Crowne Plaza Times Square Manhattan. The new contest, the first of its kind for the Crowne Plaza Times Square Manhattan, is open to amateur and professional photographers alike and of any age. * And photogs can submit as many images of their favorite Big Apple moments as they like, no purchase necessary, by simply going to the Home page of the hotel’s Web site at http://www.cpmanhattantimessquare.com and clicking on the More Info button under the Win a Free Weekend Stay Heading. They just need to do so by the 6 a.m., April 15 deadline for entries. The winner will be announced on April 30, 2012. 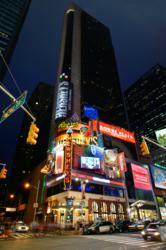 In addition to the free weekend at the amenity loaded 795-room hotel, the winner will have the rare opportunity of seeing his or her picture play a part in the world famous Times Square light show – it will be displayed on the front of the Crowe Plaza Times Square Manhattan on its giant 23 by 34 foot screen during the stay. A continually updated gallery of the entries is available via that More Info button under the Win a Free Weekend Stay heading at http://www.cpmanhattantimessquare.com/ so Your Favorite NY Moment Photo Contest participants can check out the competition. The Crowne Plaza Times Square Manhattan sits at the Crossroads of the World, welcoming discerning travelers from around the globe. The hotel boasts 795 well-appointed guest rooms outfitted with contemporary accents and plush Sleep Advantage™ beds. Every room offers breathtaking views and on-site options abound, such as relaxing over a cocktail at Broadway 49 Bar, tasting a fresh spin on new American eclectic cuisine at Brasserie 1605 or working out at one the city’s largest hotel based fitness centers. *A winner under the age of 21 will need to be accompanied by a parent or legal guardian for the weekend stay.